Tel Aviv - Israel's deputy foreign minister Wednesday apologized Wednesday for his treatment of Turkey's ambassador to Tel Aviv, saying he had meant no "disrespect" and seeking to calm a diplomatic spat sparked by an anti-Israeli Turkish television drama. Deputy Foreign Minister Daniel Ayalon had summoned the ambassador, Ahmet Oguz Celikko, to Jerusalem Monday to protest against the new drama series. Israel regards the films a "anti-Semitic" because it portrays unscrupulous operatives of its Mossad intelligence agency kidnapping Turkish babies. 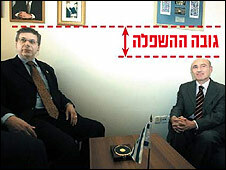 In a break from diplomatic norm, Ayalon invited the press to take photographs, made sure he sat on a tall chair while the Turkish envoy sat on a lower chair, and when housekeeping brought refreshments, ordered them to take them back. Celikko was also filmed waiting in a corridor for the meeting to begin. He later told reporters that never in his 35-year diplomatic career had he experienced such humiliation. He said Turkey demanded an apology. Ayalon subsequently issued a brief statement Wednesday, saying:"My protest against the attacks on Israel in Turkey remains valid. Nevertheless, it is not my way to disrespect ambassador's honour and in the future I will clarify my position in a diplomatically acceptable manner. "Other Israeli cabinet ministers, although also angered by the television drama, said Ayalon's treatment of the Turkish ambassador had been unnecessarily harsh and humiliating. Turkey has been a key strategic partner to Israel in an otherwise largely hostile region, but ties between the allies have deteriorated since last winter's Gaza war, which Turkish Prime Minister Recep Tayyip Erdogan has repeatedly harshly criticized. Another, earlier Turkish television drama series, which among others portrayed the Israeli military as shooting squads against the Palestinians, had also sparked a diplomatic row. Israeli Prime Minister Netanyahu said late Tuesday he was concerned Turkey was distancing itself from the West and moving closer to Islamic states seen as Israel's enemies, including Iran. Israeli Defence Minister Ehud Barak is due to visit Turkey Sunday.